It is that time of the year and we have come to the end of the Halloween season. I wanted to end this year with a movie but I think, after rereading this for the sixth or seventh time, that today’s graphic novel is much more appropriate. This year I have written about the glory of the vampire genre and its wonderful tropes and clichés. Also, I have talked about amazing writers and directors who have recreated the vampire mythos in their own special ways. Today is no different and to end on the strongest note possible, I think it is important that today’s work be read by as many people as possible. Today, we look at Scott Snyder’s unbelievable stroke of genius, American Vampire. Scott Snyder is an amazing writer, one of my favorites. He published a great collection of short stories called Voodoo Heart in 2006 and afterward, began writing for Marvel with a run on The Human Torch and later Iron Man: Noir. While those two comics were good and hinted at Snyder’s talent, he really flexed his muscle in 2010 when he began writing for DC’s Detective Comics, putting out what would eventually be collected into a miniseries called The Black Mirror. In this work, Snyder delivers a Batman storyline that blends the DC universe with psychological horror in a way I have never seen done. From here he became the architect of the New 52 Batman universe along with incredible artist Greg Capullo and from there his work has crossed multiple companies and subject matter. In the middle of his rise to fame, Snyder published American Vampire through Vertigo Comics. This series, which won the both the Eisner and Harvey awards for best new series in 2011 and rightfully so. What this comic series, now 9 volumes long, each spanning a [particular decade or event, and does for the vampire genre is exquisite. This work changes the vampire mythos in new and interesting ways. Also, as a great example of quality, Stephen King enjoyed it so much that he actually wrote the backups for the first volume. 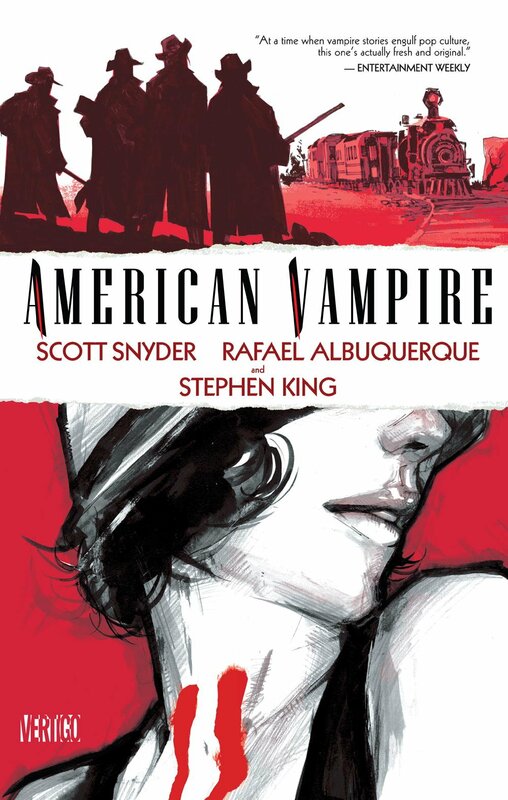 That is what I am talking about here today: Volume 1 of American Vampire. The story, like a lot of King’s works, is split between two time periods. I can sum up King’s storyline much quicker than Snyder’s so I will start with him. King details the history of Skinner Sweet, a notorious and heartless bank robber and murderer, who is accidentally transformed into a vampire by a wealthy business man. Sweet is not like older, European vampires in that wood does not harm him and he can exist in daylight. King’s story shows from before his transformation until years into the future when he pays a visit to an old friend. The wonder of King’s backup story cannot be overlooked. He provides a very real, very visceral beginning to one of my favorite comic characters of all time. Snyder’s story follows a struggling, bit-part actress named Pearl Jones, as she works three jobs trying to make it in the movie industry in the mid-1920s. One night on set, she is invited to a party of Hollywood insiders and, in hopes of getting her big break, ignores the advice of a wanderer and ventures forth to claim her dream. Instead of a new role, it is revealed that many of Hollywood’s elite are vampires who use extras as cattle. She is fed on and left for dead but before she can die, the mysterious man, Skinner Sweet, shows up and transforms her. He then lets her loose on the old world vampires in an all-out declaration of war: The American vampire vs. the European vampire. The Europeans fear Pearl and Skinner because they are not aware of any weaknesses the new breed may have except that once the moon is gone, they are weakened. This is where I will leave the plot summary. I want to give you just enough to whet your appetite. Along with the incredible storyline, we are given an unbelievable gift in the world of art. Rafael Albuquerque delivers pencils in a way that is rarely seen in modern comics and his style is perfect for the horror inherent in this book. His characters have real personality and movement in the frames and his sketchy, yet defined style is something wonderful to behold. IN fact, as strong as the writing of both Snyder and King is, this book would be far weaker without Albuquerque’s illustrations. Dave McCaig’s colors are also on point, bleaching out just the right amount of the pallet so that when the blood flies, it is incredibly bright and brilliant. If you take no advice that I have given this year, please just do me a favor and check this out. American Vampire is arguably the most important work in the genre since Anne Rice and Snyder’s vision has stretched for six years while maintaining the quality with which it began. You owe it to yourself to read this work and send the Halloween season off with a fang.